Mahabalipuram, also known as Mamallapuram is a place near Chennai in the state of Tamil Nadu in India. 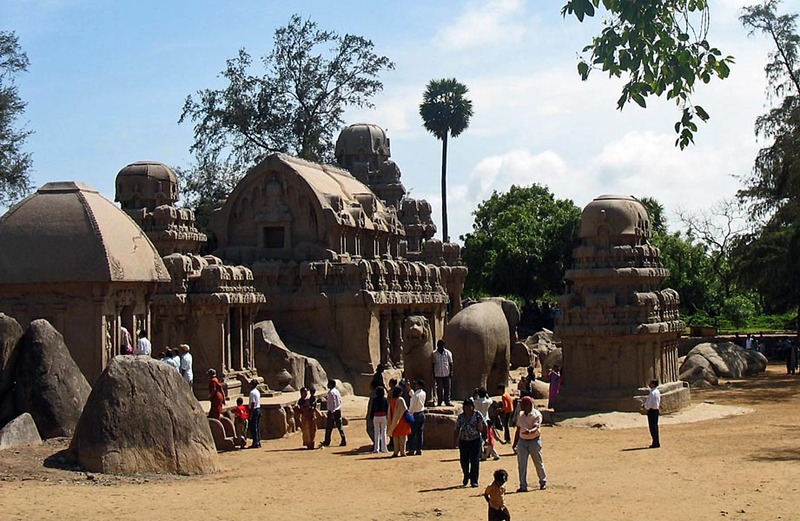 Mahabalipuram is a historical place, and was a bustling sea-port and trading centre in ancient times around the first century CE. 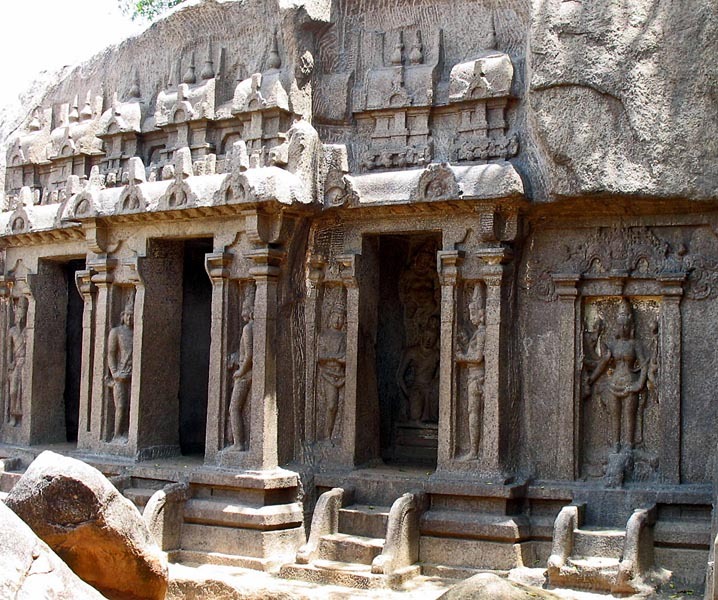 Many temples were built in this town and these photos are of the temples built in the 7th Century by the Pallavas dynasty of South India. This area is a UNESCO World Heritage Site. These photographs are of a small group of temples in close proximity to each other in a small compound, and this cluster is near the famous Shore Temple and other famous Mahabalipuram temples in the vicinity. Note the small independent temples in this temple compound at Mammallapuram. Sculptures of Elephants are often find in and around Indian Hindu temples as this animal is considered sacred to Hindus. The elephant connotes attributes like abundance, fertility, strength and wisdom. 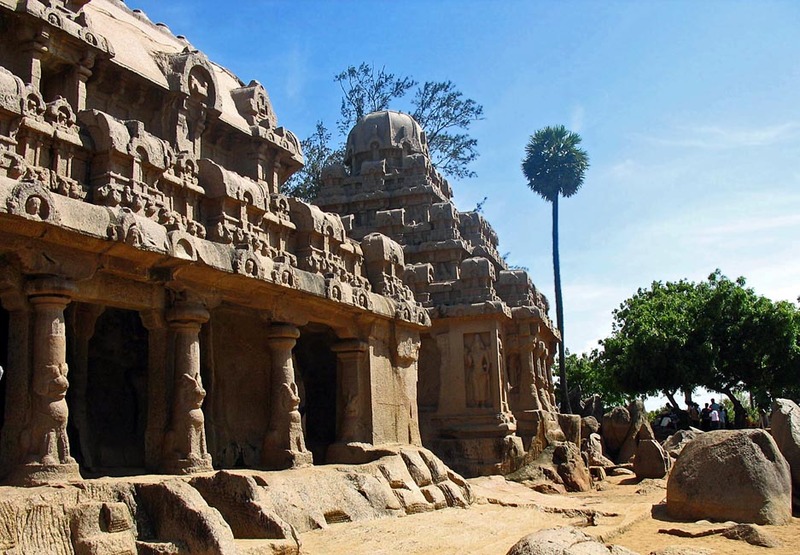 A view of the temples at Mahabalipuram with the blue sky in the foreground. A closer look at the carvings and figures of the temples. 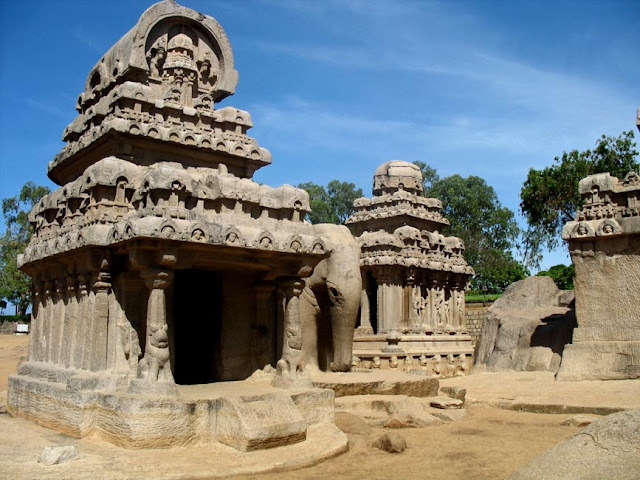 You might also like to see pictures of the Shore Temple at Mahabalipuram or Mammallapuram or photographs of Meenakshi Temple or Tiru-alavai images or check out the scores of images filed under the label "Temples" where you will find temples from different parts of the world, as well as sketches and silhouettes.